This early 1900s Real Photo postcard identifies the little L-shaped building with a huge entrance tower and belfry as South Park Chapel. That was the first name of what is now Rock Island’s South Park Presbyterian Church. One definition of a chapel is a small house of worship, usually associated with a larger main church. That was true of South Park Chapel – but its main church was a mile away from this semi-rural house of worship. How did this happen? As Rock Island grew during the second half of the 19th Century and the lands below the bluff were filled, there was no room for new construction. To meet the needs of potential homebuilders, developers began to subdivide land on the hill top. One such subdivision, in a timbered area between 14th and 16th Avenue and 30th to 31st Street, was called the South Park Addition. Among the families who moved to the bluff were those who had attended Broadway Presbyterian Church. But it was hard for them to get back to their old church for regular services — transportation was not so easy in that era as it is nowadays. So Broadway’s pastor, Dr. William Marquis, was quick to take advantage of the developer’s offer for two free lots at the corner of 30th Street and 15th Avenue to construct a mission outpost there. The cornerstone was laid in 1888 for the mission and it was dedicated on October 7 of that same year, with construction funded by the Broadway congregation. It was probably a very simple gabled structure, perhaps one side of what we see on the postcard. The mission grew, more land was purchased, and, in 1899, an addition was constructed. Yet another expansion took place in 1908. This postcard may date from shortly after that last addition. The exterior walls appear very smooth, perhaps indicating a stucco surface. The front gable has fancy shingles while the side gable is smooth. There are Gothic shaped tops in the belfry openings and at the main entrance. Two more sets of access stairs, and what appears to be wooden planks laid as sidewalks, can also be seen. In the early years, the services – Sunday school, Sunday evening services and Tuesday prayer meetings — were conducted by Dr. Marquis or a member of the Broadway church, often a member of the Weyerhaeuser family. In 1907, Rev. William Oglevee became assistant pastor at Broadway and took over duties at the South Park Chapel. 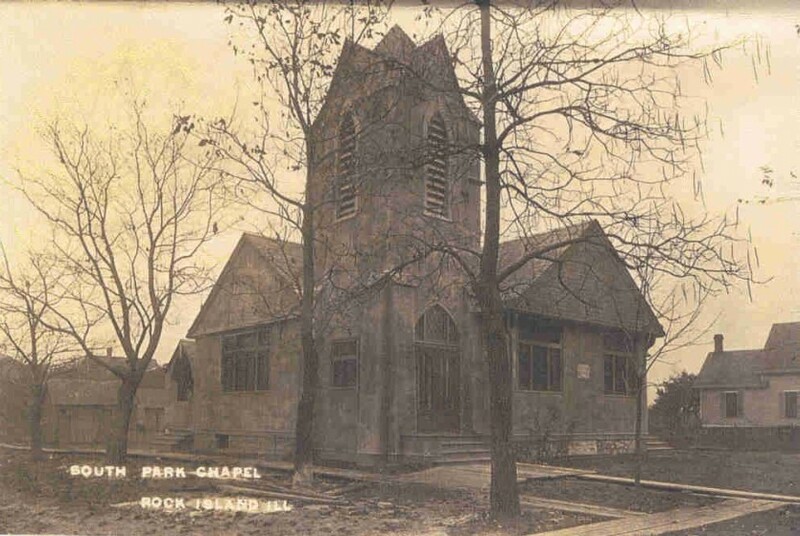 When the South Park congregation organized into an independent church in 1912, Rev. Oglevee became the first pastor. The congregation numbered 147, with 83 of them transfers from Broadway. Broadway still maintained its ties with South Park Church over the ensuing years and continued financial assistance, notably from S. S. and Apollonia Weyerhaeuser Davis. Reportedly the wealthier families still attended Broadway while South Park had a working class congregation. South Park Church continued to grow and plan for a stable future with its purchase in 1918 of a home south of the church to be used as a parsonage. Soon after, on Oct 16, 1920, the cornerstone was laid for a new brick Sunday school building. This building was designed to be the first section of what would eventually be an entirely new church. It was two stories high and extended 70 feet along 15th Avenue, where it can still be seen today. The basement was planned for the primary grades with the Sunday school rooms upstairs. Since the long-term intentions called for it to function as a community center, it had a high ceiling that would accommodate a gym or assembly hall. By 1925, the church was ready to expand again. The present sanctuary on 30th Street was built and the old chapel, the one on the postcard, was removed to create a lawn and terrace. That chapel – or part of it — was moved a few blocks to 18th Avenue, just west of 30th Street, where it was used as a commercial building. It has since been demolished. Yet another addition to the church, an educational wing that extends to the south, was completed in 1955. By the early 1960s, three more houses and lots had been replaced by a parking lot. In 2002, the parking lot was expanded to the south end of the block. Thanks to Shannon Hall for sharing this postcard and to bj Elsner’s information in the comprehensive history book Rock Island, Yesterday, Today and Tomorrow. This article, by Diane Oestreich, is slightly modified from the original, which appeared in the Rock Island Argus and Moline Dispatch on April 6, 2003.